The oil price is horribly oversold; it is most oversold since the end of 2008. My guess is that someone, perhaps OPEC, will step in and do something to prop it up quite soon. As a firm believer in technical analysis, I am willing to stick my neck out with this prediction as the chart of Brent Crude has fulfilled its down-count on the point-and-figure chart. While point-and-figure charting is considered old-fashioned by some, in my long-time experience it is one of the most valuable charting techniques available. For clarity rather than Xs, I’ve used upward pointing red arrows for up-moves and instead of Os, downward pointing blue arrows for down-moves. Using the AW Cohen three-point reversal method, the chart shows the fall through a triple bottom starting in April, continuing in May and the start of June. The break came as the price fell below $122, which signals an average fall of 23% - this level was passed on Wednesday. The AW Cohen method of point-and-figure charting is fully covered in my book, Even More Charting for Profit. The rand has lost almost all it is likely to in the short term, and is, therefore, likely to strengthen slightly in the short term. This is indicated by a break through the signal line of its moving average convergence/divergence plotting. The exchange rate has already tested the $1/R8,5 support and fallen back. On fundamentals, given that while foreign investors remain risk-averse, even if our interest rates are cut, as they are likely to be, our rates are still higher than many other countries whose rates alarmingly lag their rates of inflation. As the JSE- Overall index, the only major index to have recently recorded a new high, is out of step it may therefore mark time or ease a little in the short term. However, if astute longer-term foreign investors consider that our banks are sound and our economy doing better than some, they may be attracted by the dividend yields of our better-class shares. At home, a rate cut will enhance the appeal of shares directing more private investors towards the share market. The drastic fall in the oil price, down 26% since April, made nonsense of my April 12 newsletter where I suggested that the petrol price agony would continue. Certainly at the pumps we must still pay the +-R5 that covers the eleven other items tagged on to the basic fuel price, but come early next month, we should be paying some R1,29 a litre less than we did in May. We could of course be saving even more had the rand not lost 8,6% against the U S dollar since May. In theory the lower petrol price pulls down other prices, particularly those that use fuel in their production and are delivered by road. For the man-in-the-street, this mainly applies to food prices. However, although we are told that inflation had slowed, so far it’s is difficult to identify this using supermarket till slips. Of course, out of everything good comes something bad. Then ‘bad’ is in fact what has brought the oil price down. The price of commodities, including those we produce here and hope to export are coming down because manufacturing production in many countries has slowed to the extent that commodities are no longer needed. South Africa’s platinum mining industry is an example where things have become really bad. The slowdown in the world’s car manufacturing industry, that used platinum group metals for auto-catalysts, has resulted in an oversupply of the metal. This has reduced its price by 23% since August. At the same time, costs including electricity and labour have risen making it no longer viable to produce platinum. Mines are, therefore, closing and throwing many people out of work. At the current rate of manufacturing inactivity, other resource producers may suffer a similar fate. What about Satrixdiv for the long term? My habitual answer is to suggest that the potential investor would be safer by, say, investing in an exchange traded fund (ETF) such as the Satrix DIVI Plus Portfolio (Satrixdiv). This collective fund tracks the FTSE/JSE Dividend Plus Index and pay all the dividends received from the companies in the index to investors quarterly, net of costs. This is meant to be a rhetorical question but I also back the answer with the latest historical performance of the fund. For example, had you invested R1 000 in Satrixdiv at the end of May three years ago, your return would have been 21,6% at the end of last month and , if you had cashed in, your realisable value of your investment would have been R1 797. Some readers of this newsletter know that Jean and I set up a High Yield portfolio between November 2009 and June 2011, booking over two counters already held in our main portfolio and, over the period, adding seven counters from dividends received from the main portfolio. We also sold one counter. The internal rate of return from the portfolio at yesterday’s market close was 17,4%. This is not comparable with that of the Satrixdiv return, For one thing, our portfolio didn’t exist three years ago, and it was built periodically, as our cash pile grew. The two returns do, however, suggest that it takes a lot of work and monitoring to provide a return as good, or better, than that of the ETF. Why bother to do the hard work of buying your own basket of shares, or, much more speculatively, buying shares of just one company? Portfolio spread reduces risk, especially cyclical risk. The Satrixdiv’s asset allocation at the end of March was 19,91% in basic materials, 38,94% in financials, 12,2% in telecommunications, 12,38% in industrials, 12,91% in consumer services, 2,67% in consumer goods and 1,04% in liquid assets. Personally, I think the weight on financials is a bit on the heavy side but I can hardly fault the Top Ten Holdings at the same date: Palamin (basic materials) 8,58%, Coronat (financials) 6,39%, Kumba (basic materials) 4,94%, Vodacom (telecommunications (3,93%), JSE (financials) 3,84%, Altech (telecommunications) 3,67%, Libhold (financials) 3,62%, MMI Holdings (financials) 3,60%, Abil (financials) 3,52% and PPC (industrials) 3,42%. This is, of course, an historical snapshot but I can bet that Telkom won’t have moved into the Top Ten at the end of this month. And, so, after all this I can assure you that the potential investor still wants to buy shares in one company. He or she wants spectacular performance and wants a pat on the back. My suggestion will, as in the past be, disregarded. As I’ve often said, advice seekers don’t look for advice; they look for reassurance. Time to unzip the wallets? Were you aware that the JSE Overall index hit a record high yesterday (June 18)? This is despite the goings on in Europe, which as an exporting bloc is dealing South Africa severe body blows. Were you also aware that our overall index is the only international all-share market index one that has reached new high? With everyone, apparently save stock market investors, quivering in the side-lines holding onto their cash like grim death, perhaps it’s time for a general wallet unzipping. The share market again lived up to its reputation as a barometer as well before the results of the Greek election were known, the better market vibes had been apparent for more than a week. 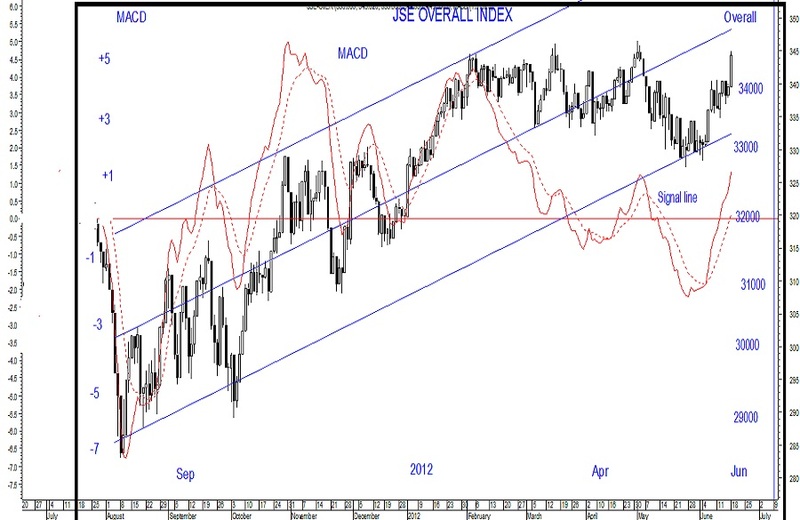 On June 6 the JSE Overall index bounced sharply upwards following its challenge to the lower edge of a standard error channel. In place since last year’s July dive, despite bedevilment by the European financial crisis, the channel has headed upwards as the index gained 20%. The world is currently in an odd state of affairs whereby there’s a serious dearth of money on one hand and a ballooning glut on the other. Those with too much, current risk-averse money hoarders, are companies scared to expand, and private individuals unwilling to invest. The world is awash with bargains, but the moneyed will continue treading water until their confidence is boosted. We’re already seeing some quoted companies increasing their distributions to shareholder rather than growing their businesses in uncertain times. Private investors are eroding the value of their cash by keeping it in financial instruments yielding less than the rate of inflation. Nevertheless, as a barometer, the chart of the JSE Overall index is beckoning companies and investors to dip their toes into new investments. Apart from the rise in the index plotting, the moving averages convergence/divergence (MACD) plotting (red solid line) gave a buy signal as it penetrated upwards through its signal line (dotted red line). There were other jittery penetrations between March and May, but this one that began well below the horizontal zero line of the MACD continues strongly upwards. Currently still below the centre equilibrium of 34 800, there is plenty of scope for further improvement in the index. However it would be expecting too much to hope that it will reach the top of the channel, currently at 36 400, any time soon. Too much because using the phrase that everyone from the road sweeper to Barrack Obama throws around, all the Greek election has achieved is ‘kicking the can further down the street’. The can has already been kicked so often that, like our hope for a final resolution, it has become severely dented. It remains to be seen whether the Greeks knuckle down under the current austerity programme or a redesigned one, but until stimulation is injected into the all markets, things are not going to get much better. Hopefully the G20 talks in Mexico, where I understand President Zuma pledged US$2-billion to the IMF to help Europe out of its debt hole, may beat the dented can back into shape via a stimulation of some sort. Last Thursday, June 8, Telkom released its expected poor results for the financial year ended March 30 2012. On the basis of its half-year results, only optimists would have been buying or holding the shares on its investment fundamentals. In particular, they could hardly have expected a final dividend to be declared relative to its huge planned capital expenditure. When the half-year results were reported the share was trading around R29, and its historic price-earnings ratio (based on 12-months’ headline earnings per share) was 11. With a high probability that bottom-line earnings per share would be well down over the full year – a probability that has been realised – I figured that the p:e was challenging. Surprisingly, perhaps, the share price didn’t begin to crumple until February this year, after which it did indeed begin to collapse. At the end of May it was trading around R24. Savvy investors, I guess, had followed the adage to go away in May because at the end of the month, they came back in droves. On May 31, trading volume on in Telkom shares boomed – more than 40m shares were traded on a single day – double the previous record over the past five years. And, following the publication of the latest results the share is now trading around R20. Savvy month-end sellers; not so savvy buyers. I didn’t buy Telkom shares when they were listed. Even then I was uncertain about management mainly because of customer dissatisfaction, a symptom of poor management. Then Telkom disposed of its stake in Vodacom, a flawed decision at a time when the mobile market was in a strong growth phase. Now, when the mobile market is more mature and much more competitive, Telkom is back in. Well, its much changed management may know more about what is good or bad strategy. I don’t know if customer satisfaction has improved. I was forced to write to chairman Lazarus Zim to stop the company from charging for lines which had been stolen six months earlier. The lines, a year later do not yet exist, but I’m more than happy using a cellphone and a broadband connection on wireless via Internet Uncapped. As you will have read, seen and heard Telkom’s management has defined its strategies and how it plan to implement these strategies. All this will cost a bundle of money – hence no dividends to shareholders for some years perhaps. And hovering behind is the ominous shadow in note 15 of the report which summarises the contingencies. Imagine, if, as is possible the Competition Tribunal imposes an administrative penalty of 10% of its annual turnover? This maximum probably won’t happen and we also don’t know how the company will fare in its long list of litigation actions against it. The reality in my view: Telkom is trying to travel a pot-holed road, lined with dangling telephone lines. At a share price of around R20, based on the latest headline earnings per share of 324,7c (basic earnings were only 10,4c), the p:e of 6 tells me the share is over-priced. If the price indeed reflects its value, I still wouldn’t touch the shares until the company has proved it can implement its costly plans. Just type in your email address, and you’ll be subscribed automatically.